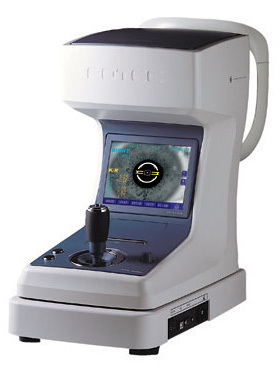 Autorefractor Keratometer Potec PRK6000 - Ophthalmic Equipment and instruments for the professional of today. Autorefractor Keratometer Potec PRK6000 provides an extensive dioptric measurement range (-25D to +22D), and the radius of curvature for keratometry is 5.0mm to 10.2mm. Easy alignment and friendly operation allows you to measure the refraction and keratometry in sequence, and the results can be validated immediately. Owing to its easy alignment and friendly operation you can measure the refraction and keratometry in a sequence, the results can be checked all at once. Using the freeze function, measurement of the diameter of the cornea, pupil or hard contact lenses worn by the patient can be performed. By simply touching and dragging the screen with your finger measurements are exactly calculated. Simply touch the "PRINT" icon on the screen and the Autorefractor Keratometer Potec PRK6000 will immediately provide a complete printout of the measurement results. An Auto Cutter is provided for convenience. In autorefractor Keratometer Potec PRK6000 the Data can be transferred to external devices (personal computer, etc.) via an RS-232 interface. A USB interface is also provided for future compatibility. Are you done with the Autorefractor Keratometer Potec PRK6000 ? Go to Autorefractors.